is the clunk associated with a misfire? Yes, when it made the clunking sound it started misfiring. (Bad enough that the engine stalled) Restarted 3-5 minutes later and it was silent and running smooth again. The lighter sounding tapping noise came back same as usual though, but it does not misfire with that noise. The Melling stock replacement lifters for the sixes tick a little at hot idle. All 12 lifters equally. It's not a load sound, just a soft mechanical rhythm. I'm not sure why the Melling lifters do this, but they do, and I've had them doing it for more than 100,000 combined miles on three different engines. The shaft rocker engines don't have a lot of oil flowing around up there. They receive just enough oil and not much more. They're not like the later pedistal rocker engines that splatter oil all over inside. Still, there needs to be some oil. No oil usually means the hollow rocker shaft or the oil path leading to the rocker shaft has plugged up with sludge. Every 40 year old engine with shaft-lubricated rocker arms needs to have the shaft and oil path cleaned out to prevent valvetrain damage from oil starvation. This is an "alleged" fresh rebuild on the engine. It appears as such. Everything painted well, bolts are raw metal still, so it was at least painted while disassembled. I know nothing about the internals. But I think you may be on to something there. I will be working on it again at the end of the month. I am going to see what I can find. And if possible take a video of it running. I will absolutely be doing the head bolt mod, and cleaning the rocker shaft passages. I appreciate all of the input from everyone!!! If you look up camshaft bearings for a 232 you will see one with two holes. That one goes in the second to last position. The oil flow to that bearing comes up a bore from the oil gallery fed by the oil pump. The only way it can get to the top is by flowing around the center groove in the cam bearing and go out the other hole to a drilled hole in the block to the head. If the cam bearing doesn't have a deep enough groove or it is worn out or the holes don't line up with the drilled holes in the block then no oil to the top. If ever I had another of these apart I would take a Dremel and cut a groove in the block outside of the bearing from one hole to the next so oil could go around the outside of the bearing and get to the top. The engine I worked on had a hint of a groove outside the bearing like someone thought that is what should be done but not deep enough for oil of any quantity to flow. If the head bolt mod is not successful there is the option of putting on an overhead oil line to it. Yes, when it made the clunking sound it started misfiring. it may be that the clunk is caused by the misfire, and not vice versa (why i asked). i'd get this thing running and driving -- if it isn't, sounds liek you just got it on the road but fill us in -- then worry about klunks. exhaust systems tap on x-members, whatever. the *misfire* is carb and/or ignition, almost certainly. maybe back up, give us more global context here? how recent is this rebuild, in miles, and days/weeks? do you have run time on the engine? is it broken in? have you logged highway miles? or is the the first fire-up after rebuild? if the engine was assembled with the wrong cam bearing, and that's starving the top end, all is not lost. i had, and i think still have, one of these modded bolts. it would not be that difficult to fabricate in a home shop, and seriously not a big deal at a paid-for shop. both the bolt AND the valve cover need to be modified. 1) get an extra rocker shaft bolt and drill a hole down from the top, through the head into the shank. the hole depth is such that it the bottom of the hole is in line with the hollow rocker shaft. 2) a small cross-hole is drilled into the shank of the bolt. the hole is drilled in the part of the bolt that exists in the middle of the hollow rocker shaft. drill the hole through to the previously drilled longtitudinal hole. 3) the top hole (in the head) is counterbored to 3/16", about 1/4" down. 4) into this hole a short section, 3" or so? of "brake line" is installed. this is brazed in place. 5) drill a 3/8" hole "in the right place" on the valve cover. insert a rubber grommet into this hole, that has a 3/16" id. see below for "right place". 6) install all this junk and torque it down. 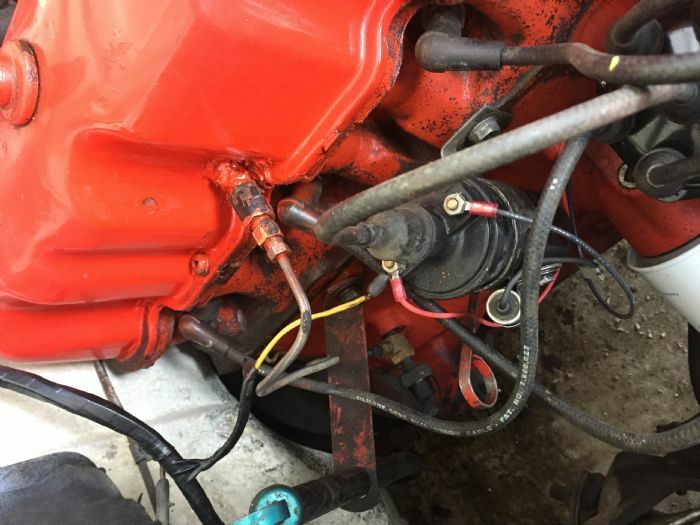 7) plumb a 3/16" brake line up from the main gallery (easy) up to the tube nbow sticking out of the valve cover; it gets joined to the plumbing with a slip-on compression ferule and nut. each step is not that big a deal. i had one junk/core engine that had this setup. it's easier than a second engine teardown. ...or my method for things like this, which is to install the new bolt temporarily without brazing the tubing; chop a section of tube, experimentally, until it *just* touches the inside of the valve cover when installed, take the cover out, put blue tape at the spot, put the valve cover on and wiggle it to make a mark. another choice if you screw up is to cut a larger hole, like 1", and cut a 2" square of sheet metal, drill and grommet a hole in it, shape it to match the curve of the valve cover, attach the valve cover so the tube sticks out the large hole, place the 2" thing over it and sheet-metal screw it in the righrt location. you could probably conjure up a way to leave an inverted flare nut on the tube and make a two-piece cap, etc. sheesh wtf -- i cannot seem to edit an error in the URL. When putting my engine back together and before bolting the head down I remember turning the oil pump and oil coming up through the block as it should. After the head was bolted down and the oil pump was turned oil did not make it up the pedestal to the rocker shaft, at which time I put in an overhead oil line. Probably the head should have been removed for further investigation like if there was a problem with the head gasket or what else it could be but I just carried on with the external line. I'll post pictures of how it was done but that may take a few days. Check the spark plugs. A freshly rebuilt engine will burn a good bit of oil until it's broke in. If the plugs are really bad just go ahead and get new. Run it a couple hundred miles and check again, clean while you have them out. Might not be the problem, but it could just not be broken in good and making a little noise. I'd definitely do the head bolt mod regardless. Might not be absolutely necessary, as the engines ran originally just fine -- took a little time and neglect to sludge up a bit. Type of oil made a difference too -- I remember Quaker State and other Pennsylvania crude based oils used to sludge up more than others -- but not today. Oil formulations have changed drastically since the 60s!! Another version of an overhead oiler. Figure it all out first before drilling any holes. Remove the valve cover and drill a 1/2" hole through it just above #5 spark plug, drill and tap a 1/4-28 hole into the oil cavity of the head, reinstall valve cover, discard the needle of the grease fitting shown in the picture, pretend that piece of pipe is only 2" long and hook it all together for the overhead oil line that tees into where the oil pressure sending unit goes. Then seal around the hole in the valve cover and good to go. As the line is quite short it is not nearly so visible as one going down through the top of the valve cover. Most of it is hidden behind the transmission filler tube, hence the curve in the brake line.